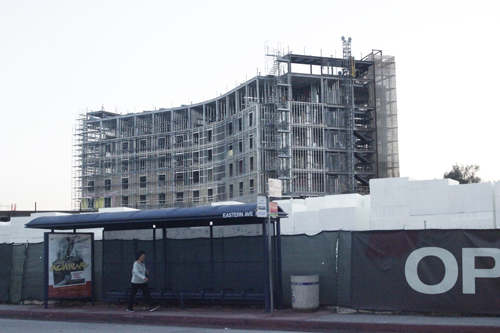 An increase in revenue coming from the opening later this year of a highly anticipated seven-story, 100-room hotel at The Bicycle Casino, could just be the winning hand Bell Gardens needs to keep its budget on the plus side. On Monday, the city council approved a $27.9 million budget that includes a $211,000 surplus, most of which can be attributed to tax revenue the city receives from the Casino. The Bicycle Casino is a “major revenue source” for the city, says Finance Director Will Kaholokula. He said Bell Gardens receives a percentage of the Casino’s take from table games and poker tournaments, which should come to just over $11 million for the 2015-16 Fiscal Year; $1 million more than last year. The higher revenues in the new budget are based on the “Casino’s strong performance in the 2014-2015 fiscal year and the anticipated completion of the casino’s hotel,” Kaholokula said. While the city has for years depended heavily on revenue from the Casino to fund city services like police, parks, and street maintenance, that reliance has been decreasing steadily in recent years, dropping to 40% today compared to 50% in years past. 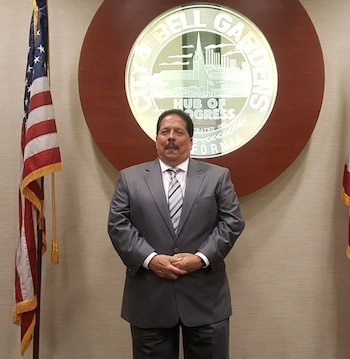 Bell Gardens Chamber of Commerce Director Mike Salazar, however, told EGP he still thinks the city is “depending on the casino way too much.” He is worried a period of poor performance could put the city’s finances at risk, as it has in the past. His concern is not with the new hotel’s financial viability, because he does believe it will do well, Salazar clarified Thursday. He just thinks the city could improve how it supports other Bell Gardens businesses to make them more successful. Hotel revenues peaked at $13 million in 2008 before bottoming out in 2012, dropping to $9 million during the widespread economic downturn. As a result, the city’s finances also hit rock bottom, forcing Bell Gardens to cut back on services and froze staff positions to deal with its more than $1 million deficit. Even with construction going on, “people have continued to make their way to the Casino,” Wagner pointed out. Casino revenues are still increasing, he said. The $45 million privately-funded hotel, which will open its doors in the fall, is expected to generate $160,000 of the city’s $470,000 in “Other Revenues.” The money will come from a Transient Occupancy, or bed tax. Adding in the bed tax puts revenue from the Casino back over 40%, says the Chambers’ Salazar, and to him that’s a concern. But Wagner defends the city’s reliance on Casino revenue. Bell Gardens is not like its neighbors, he said. “Other cities have various manufacturers, car dealerships and other sources of revenue, our major source happens to be a casino,” he said. Salazar says he would like to see the city diversify its general fund revenues and do more to help local small businesses be more successful. Bell Gardens’ community development director, Abel Avalos, thinks the city is making progress in that direction. He told EGP that 55 new businesses have opened in Bell Gardens this year alone, bringing new revenue with them to the southeast city. The city has been renovating shopping centers located near the Bicycle Casino. There are rumors that restaurants and eateries such as Dunkin Donuts will be opening soon in those areas. Wagner is confident that the hotel will be an attractive addition to people who normally play at the Casino. He said the city is making the area surrounding the Casino more attractive in hopes of getting Casino guests to spend their dollars or winnings within the city. The hotel will add 230,000 square-feet to the Casino footprint, creating a resort-like venue conveniently located near the 710 Freeway. Once complete, it will be one of only a few luxury hotel and casino resorts in the southeast area. The Bicycle Casino remains the city’s largest employer, and the hotel project has added 300 construction jobs and will create 250 full-time, hotel-related jobs when it opens. That’s good news in a city where the unemployment rate stands at 8.2%, two to three points higher than the unemployment rate for all of Los Angeles County. During the recession, the city’s unemployment rate climbed to nearly 20%. Overall, revenues in the city are up $2.3 million over last year, but the increase is offset by $2.4 million more in anticipated expenditures, most of which can be attributed to a rise in employee-related costs for CALPERS contributions, salaries, health insurance and liability insurance. $200,000 will be added to the city’s $2.3 million reserve or “rainy day” fund, money set aside to pay for unexpected expenses like a water main break, Wagner said. As in years past, the city-owned water utility continues to run a deficit, with fees falling below the actual cost of operating and maintaining the aging water system. The city has not raised customer’s water rates since 1994, and the city council has been reluctant to either increase rates or sell off the city’s water rights as recommended by city staff. “Some decisions we have brought before the council in the past will have to be addressed soon,” Wagner told the council, referring to the utility’s estimated $1 million dollar deficit. Public Works Director Chau L Vu said the city has nearly $5 million in proposed capital improvement projects next year. Projects include floor replacements at gyms, roof replacements, citywide traffic safety enhancements and illuminated street signs. Grants and bonds and other monies not from the general fund will pay for the projects. “I remember thinking it can only get so bad before it can get better,” said Councilwoman Priscilla Flores. “Now that we’re moving in the right direction I would like to see some things come back,” she said, referring to services and festivals cut during the lean years. [Update 3:02 p.m.] Adds information to clarify Bell Gardens Chamber Executive Director Mike Salazar’s statement on Bicycle Casino Hotel.